If your home mortgage is underwater (meaning your home is worth less than the amount you owe on the mortgage), or if you can no longer afford the monthly mortgage payments, you might be considering a short sale. This is a sale for less than the balance owed on the mortgage, which can only be done with permission from the mortgage holder. If you get this permission, a short sale can get you out of a home you no longer can afford or which has become a bad investment. Regardless of how attractive a short sale may seem, be aware that it can be difficult to obtain permission to proceed from the mortgage holder. Also, short sales can create unexpected income tax problems for some people, and there can be other pitfalls as well. As a result, lawyers usually don’t recommend that consumers attempt a short sale of their home. 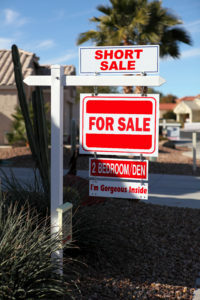 Nevertheless, for those who are considering a short sale, you should know that they come in two varieties: (1) a short sale where the mortgage lien is released and you are also released from any liability on the mortgage note itself, and (2) a short sale where the mortgage lien is released but you are still liable the unpaid balance on the mortgage. Here’s how a short sale works: let’s say you owe $200,000 on your home mortgage, but your home is only worth $150,000 due to a declining market in your area. Obviously, no one is going to offer you enough money for your home to pay off the entire mortgage. In this example, the only way a sale is going to happen is if the mortgage holder agrees to accept less than the entire balance at the closing. If your real estate agent is able to convince the mortgage holder to proceed with a short sale, you will likely be accepting an offer from a buyer that is close to your home’s market value. In our example, the closing will likely look something like this: an offer of $150,000, with about $6,000 or so going to the real estate agent for the seller’s commission, and about $144,000 going to the mortgage holder. This is “short” by about $66,000 of the amount needed to pay of the mortgage, hence the term “short sale.” A mortgage holder normally won’t agree to accept less than what it’s owed before releasing the mortgage lien, but it might do so to avoid an even bigger loss if it has to foreclose on the mortgage once you quit paying. A short sale, therefore, simply means a sale where the mortgage lien is released, even though the entire mortgage balance is not being paid at the closing. Now comes the important question: will the mortgage holder not only release the mortgage lien and allow the sale, but will it also release you from further liability on the mortgage note itself? Obviously, much of the benefit of doing a short sale is lost if the mortgage holder won’t release you from further liability on the unpaid balance. If this is the case, you might decide that doing a short sale simply isn’t worth it. You should do everything possible to get the mortgage holder to agree in writing that you aren’t liable any further on the mortgage note. If they won’t put it in writing, forget it; in all fifty states, a written contract cannot be modified by a verbal agreement. In some cases, you might desire a short sale even if all the mortgage holder is willing to do is release the lien to allow the sale. If this happens, be sure to have a plan to deal with the unpaid balance you will still owe on the mortgage note, even after your home has been sold.